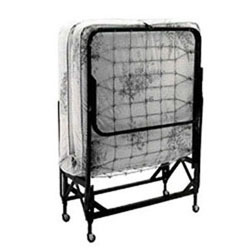 Rollaway Bed, Deluxe Model with upgraded 5” thick Innerspring Mattress; swivel casters for mobility. 30" X 74" mattress size, 250 lb weight limit. Please order sheets separately.